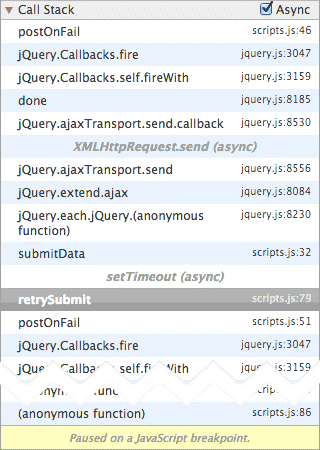 On enabling the async call stack feature on Chrome DevTools, you, as a developer, will have the ability to look into the state of your web app at every point of time. Some of the common stuff comprises of going through the event listeners, such as XMLHttpRequest, setTimeout, setInterval, promises, requestAnimationFrame and a whole lot more. Also, during your walk through the stack, you will be able to even view the value of any variable that you wish to at any specific point of time. Basically, it acts as a complete time machine that allows you to view all that you need to. We shall now learn to activate this feature and then get going with a few tasks. To try out the async call stack feature that is offered in Chrome DevTools, you can visit the Sources panel of Chrome Canary DevTools. Then look for the Call Stack panel, which can be found on the right hand side, and check the box that is present right beside Async. Toggling the checkbox will either turn it on or off. Now that we are set, we will take a look at some the things that you can do with this feature enabled to your advantage. One of the issues that you night have faced pretty often is with Gmail. Something like this happens. Now, this is mainly a problem that concerns the sending of the request, either the server has been facing problems or there is a network connectivity issue on the client side. However, what Gmail does to recover from such a situation is to try and resend the message after a short timeframe. 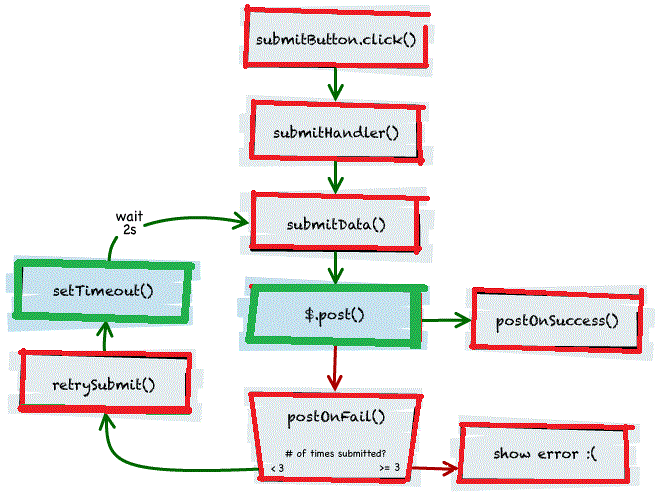 If you wish to see how async call stacks can actually help us see and study delayed timer events and XHR responses a flowchart has been provided to assist you. You can also do a demo run of the code provided for your perusal. We were not able to submit your information. Do you want to try again later? Following is the work flow diagram showing the execution flow. Also, if you had looked into the Call Stack panel previously, there would be very little information on postonFail(). However, with the present version of DevTools, you can even go on to see if the request happened to be initiated by the submitHandler(), which happens on clicking the submit button, or the retrySubmit(), which occurs after a timeout. If you happen to walk through the entire call stack, the watch expressions also update and show the state that they happen to be in at a point of time. The GIF given below will show you a little demonstration about how this can be seen. From the DevTools console, it is also possible for you to calculate, store or evaluate the values from the several execution points. Thus, staying with DevTools alone helps you from going back to your original source code, if you feel that there is a need to change certain parts of it, and then again refresh the browser. You must have seen how the previously provided mock Gmail was pretty hard to decipher without having the call stack async enabled. So imagine what the case would be with the likes of more complex flow, such as chained promises. The call stack feature simple helps you track everything in such cases too, and it’s a whole lot easier for developers. 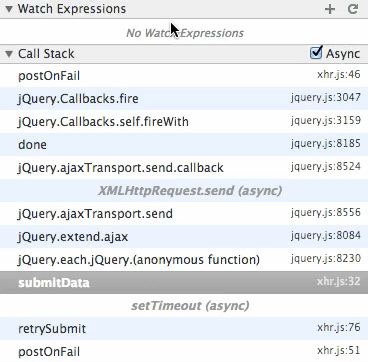 With async call stacks, one can get a lot of insight into requestAnimationFrame. Infact, it gives you the ability to go back all the way to the call back that initiates the scroll. The MutationObserver feature allows developers to observe changes that may come about in the DOM. In this piece of demonstration, every time you click on the add button, a new DOM is added. Now, if you add a breakpoint within nodeAdded() in say line 31, you can then walk the call stack right through the addNote() up to the click event that initiated it.